Proxymizer is an anonymizer (a proxy server connecting to other proxy servers), allowing simultaneous use of several public proxy servers, one per single request. Highly extensible and configurable. Ensure that your Internet provider won’t censor your traffic because you ask for specific URLs (assuming your traffic is legal, of course). Ensure that the server won’t collect personal information, such as your IP address. The solution for both problems is of course to use a proxy to bypass specific censorship and to avoid being spied. Where to find a proxy? How to tell if we can use them (and they don’t send our personal information)? This is where Proxymizer comes: it find public proxy servers (a lot), tests them against reliability and confidentiality and uses them as relays. You just use Proxymizer as your proxy, it handles the rest of the job. 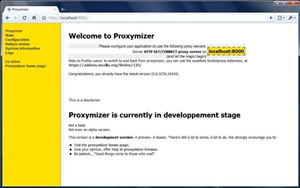 Basically, proxymizer is a proxy relay. Example 1: when loading an HTML page with different objets, each objet is requested via a different proxy, depending on each proxy ability. Example 2: when using an application that connects to many others, each connection goes through the most available proxy. Use indifferently any proxy type (HTTP with or without tunneling or SOCKS). It downloads proxy servers list from public pages. It checks every added hosts for speed and availability. Public proxy servers can not be trusted. Using them still requires communication encryption (SSL) if you want full security. Proxymizer does not alter HTTP messages, so your cookies, your browser specifications are not obfuscated (that’s not the job). If no public proxy servers are found and validated, then the application just doesn’t work. Don’t forget to read the full features list.